Incentives – Address the question; “What’s in it for me?”, and convert prospective customers into paying customers. SMS Messages – Every message must be read before it can be deleted. Instant, cheap and with a high conversion rate. Personal endorsements – Marketing messages are sent from friend-to-friend instead of company-to-friend. Messages therefore have higher credibility and persuasion power. offer free incentives to lure new customers to your business. create urgency by setting a deadline for expiration of vouchers. solicit personal endorsements that guarantee the highest response rate. eliminate risk, since incentives are only issued to real customers. measure income and expenditure in real-time, i.e. to determine the exact ROI (Return on Investment) for every advertising rand spent. trigger a viral marketing campaign that grows exponentially over time. Customers are requested to send a discount voucher or other incentive to a friend through the Tell-a-Friend system. The system generates a unique voucher and together with a personal recommendation of your product or service, it is sent to friends’ cell phones. BOTH the sender and recipient receive a gift, discount or any other incentive, but only when they pay for a product, event or service. Friends tell their friends and so the system grows exponentially with more and more people joining. Incentives (vouchers) can be of great value because they are only awarded when a new customer pays for a product or service. You save on marketing expenditure since every free voucher is linked to a paying customer. The system keeps track of existing vouchers and there is the option of issuing multiple vouchers to one customer. You can build a large customer database that grows exponentially over time. This method is spam free. It is more credible when prospective clients receive messages from someone they know instead of a business. Response rates are therefore much higher than with regular bulk SMS campaigns! Cost of messages and subsequent income is tracked accurately in real time to evaluate the success of the campaign. (Print-, radio- and television advertising often leads to unnecessary expense because the cost of the campaign cannot be linked directly to the response received). With bulk SMS campaigns you can only send messages to your current database (if you have one). A database can be built from nothing OR grow an existing customer database when customers invite their friends that are not yet customers. Bulk SMS messages do not carry a personal recommendation, except from the company itself. When a friend tells another friend, the messages are more credible and the response rate much higher. Bulk SMS messages sent and received without permission is considered to be spam. It is a sure way of hurting your business. Vouchers received from a friend are considered a nice gesture and the response is always positive. Following-up on bulk SMS may annoy prospective customers. Participants sending messages to their friends do the followp up marketing for you, because they receive a discount when their friend/s subscribe. This is a GLOBAL service and vouchers can be sent anywhere in the world. A computer with Windows XP, Vista or later and an Internet connection. We are currently giving away discount vouchers to the value of $ 15-00 that will expire on Tuesday, April 30, 2019 . Important to note: We reserve the right to amend prices at any time, unless you have a valid voucher that locks your subscription to the current price. Contact us today to get a discount voucher and some pricing information! Your campaign will start as soon as your application is processed. For most subscribers only 2 new customers are required per month to pay for the service. When you subscribe, complete instructions will be sent to your email address. Your statement will reflect payment to "Qualitone". Your account will be configured in 24 hours and you can start your promotions immediately. Click here now to subscribe and pay online using your credit card. 100 free SMS credits per month are included in the subscription fee. Qualitone was established in 1991 and specialise in Internet development and integration. We are based in South Africa and provide Internet development services to clients across the globe. Fill out the required fields below and click 'SEND' to submit your enquiry. Check your email in a few minutes for the discount voucher and some pricing information. You may also request access to our DEMO ACCOUNT, but we need your full contact details. Enquiries will be answered in 48 hours. 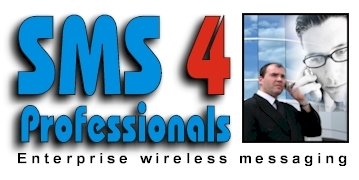 The full suite of SMS 4 Professional Services can be viewed here.